In a 5 to 6 quart slow cooker, whisk together the broth, flour, ginger, cumin, coriander, and 1/2 tsp each salt & pepper. Add the pork, tomatoes, carrots, garlic, onion and apricots and toss to combine. Cook, covered, until the pork is tender and easily pulls apart, 4 1/2 to 5 1/2 hours on high or 7 to 8 hours on low. 10 minutes before serving, add the chickpeas to the pork and prepare the couscous according to package directions. 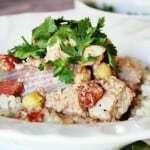 Serve the pork, vegetables and any pan juices over the couscous and sprinkle with cilantro.